How Mitosis Process occurs in an Animal cell? Mitosis is a kind of cell division occurs in the somatic or body cells of an organism. In this article I gave an account of various changes which occur in animal cell till it divides into two daughter cells. The various important changes which occur in the pre-preparatory stage, Inter-phase of Mitosis and the other different stages of mitotic cell division were explained clearly. In this article I also gave an account of significance of this cell division in living organisms. In all living multi-cellular organisms, the somatic cells or body cells of the organism undergo mitotic cell divisions to help in the growth of organisms, to replace worn out cells of the body and to repair the damaged tissue of the body. But in some unicellular organisms for the sake of asexual reproduction, so as to divide a parent cell into two daughter cells mitosis cell division is involved. Mitosis cell division is commonly known as equational cell division or homotypic cell division. Mitosis is known as equational cell division because the two daughter cells formed from parent cell are exact similar copies of the parent cell. Similarly it is known as homotypic cell division because the number of chromosomes of daughter cells after mitotic cell division will be same as that of parent cell. The sequence of events which occur from one cell division to other cell division is known as Cell Cycle. The Cell Cycle includes Interphase, Prophase, Metaphase, Anaphase and Telophase. Actually the Cell Cycle starts when the Cell is at a very small size and the division of the cell occurs when the Cell attains maximum size through Interphase stage. The actual division of the cell occurs through the four stages Interphase, Prophase, Metaphase, Anaphase and Telophase. The four stages of the Cell division occurs in a continuous way naturally but for the convenience of our study of Mitotic Cell division we have divided the division into four stages. The whole nuclear changes which occur during the Mitotic Cell Division leading to the formation of two daughter nuclei is known as Karyokinesis (Karyo means 'nucleus' and kinesis means 'division'). Karyokinesis include the four phases of cell division Prophase, Metaphase, Anaphase and Telophase. The division of cytoplasm of the cell after karyokinesis in mitotic cell division leading to the formation of two daughter cells from a parent cell is known as Cytokinesis. It is the longest phase of Cell division. It is the stage in which the newly formed small or young cell undergo several changes to attain maximum size to start cell division. Scientist generally call this stage as resting stage or sleeping stage as the changes which occur in the chromosomes of the cell are not externally visible to our eye. Interphase is bio-synthetically an active stage as all the materials which are required for cell division are synthesized in this stage. So Interphase is said to be a pre-preparatory stage for cell division. 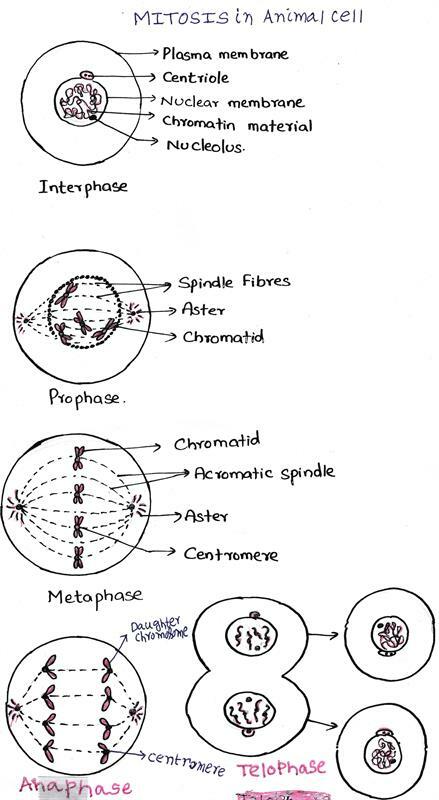 At the beginning of Interphase the condition of the cell will be as described here. The chromosomes are found in the form of long, slender thin thread like structures which become interwoven to form an entangled mass called Chromatin. The size of the cell will be small with little cytoplasm. We cannot identify the chromosomes and we cannot ascertain the number of chromosomes present in the cell. In this sub-stage of Interphase, RNA and the proteins which are required for cell division are synthesized, quantity of cytoplasm increases, cell grow in size. If the required materials are not synthesized in this stage will lead the cell to withdraw from cell cycle and reach to resting stage again. In this sub-stage the DNA of the cell get replicated or duplicated. Histone protein molecules are synthesized and cover the DNA strands in this sub-stage. In this sub-stage some more RNA and proteins which are required for spindle fib-re formation are synthesized. Mitochondria are duplicated. Now the cell is ready to undergo karyokinesis. After the pre-preparatory stage Interphase, the cell attains maximum size and it is ready to undergo Mitotic Division through four stages. Through these four stages the division of parent nucleus into two nuclei occurs i.e. karyokinesis occurs. These four stages were explained in detail with regard to animal cell below. The chromatin material of the nucleus of the cell get resolved and get condensed and transform into short thick visible chromosomes. Now we can view the chromosomes clearly and we can count them. 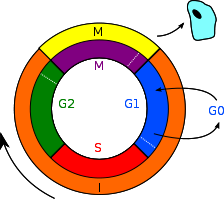 The Centro-some with two Centrioles present above the nucleus in the cytoplasm split into two bits and move to the opposite poles of the cell. A bit of Centro-some with centriole start developing radiating rays around it and such structures are known as Asters. These asters located at opposite poles of the cell helps in producing spindle fibres during the cell division time. Now the visible condensed each chromosome of the nucleus split longitudinally into two chromatids. The two chromatids of a chromosome are known as sister chromatids. The two sister chromatids of the chromosome are joined at a region is known as Centromere. Next spindle fib-res start originate from the asters and they extend from one pole of the aster to other pole. These spindle fib-res are known as continuous spindle fib-res. But some of the spindle fib-res extend between aster to the centromere of the chromosomes are known as discontinuous spindle fib-res. Microtubules aid centrioles in the formation of spindle fib-res. So all the chromosomes (each with a pair of sister chromatids) are held loosely in the continuous and discontinuous spindle fib-res formed by the asters. In the next stage nucleous present in the nucleus start disintegrating and finally disappears. The nuclear membrane present around the nucleus also slowly disappears which brings to the end of this phase. In this phase the chromosomes now become still shorter and still thicker and are most clearly visible. So Metaphase is considered to be the best stage to study chromosomes in a cell by scientists. Now the chromosomes start arranging themselves on the median line or equatorial plane of the cell. In Metaphase the centromers of all chromosomes exactly lie on the median line of the cell with the two chromatids of the chromosomes facing opposite poles of the cell. Another important point to notice in this stage is more and more spindle fib-res develop from the asters covering the chromosomes and make the whole structure appears to be a compact spindle. This compact spindle like structure found in Metaphase is known as Mitotic apparatus. Anaphase is the shortest stage of Mitotic Cell Division. In this phase, due to contraction of the discontinuous spindle fib-res which are attached to the centomeres of the chromosomes will divide them into two bits. Now each bit of centomere with a chromatid will be pulled to the opposite poles of the cell by the contracting spindle fib-res. Slowly a small invagination of the cell membrane start developing from the opposite ends of the cell on the median line. The chromatids or daughter chromosomes which reach to the opposite poles of the cell now transforms into long, thin and slender thread like structures to form once again a net work of chromatin. Then the nucleolus and nuclear membrane start reappearing in the dividing cell. So Telophase is a reverse phase Prophase, since towards the end of Prophase nucleolus and nuclear membrane disappears. Now the invaginations formed at opposite ends of the cell deepens further. Once the cell completes Telophase immediately Cytokine-sis occurs. The invaginations which appeared in Anaphase transforms into furrow dividing the cytoplasm of the cell into two halves thus leading to the formation of two daughter cells. While dividing the cytoplasm into two halves the cell organelles also get randomly shared between the two cells. The two daughter cells formed after cytokine-sis are exact similar copies of the parent cell in all aspects (in possessing number of chromosomes and genetic constitution) except in their size which are small compared to the parent cell. Aster formation occurs in animal cells as they include the cell organelle centrosome in their cells. Cytokinesis occurs by furrow formation in animal cells. Mitosis cell division in animal organisms occur through out the tissues and cells of the body. Mitotic cell division occurs only in somatic or body cells of the organism for the purpose of the growth of the organism. The two daughter cells formed through Mitosis are exact similar copies of the cell in all aspects except in their size with parent cell. Mitosis is very essential for the repair of damaged tissue, for replacement of worn out or dead cells of the body. Unicellular organisms like Amoeba, Yeast etc. reproduce asexually through Mitotic cell division only. Through Mitotic cell division daughter cells carry the same genetic information from the parent cell thus ensuring genetic stability. This article explains the genetic, biological and evolutionary significance of Meiosis. In this resource I have given a fundamental idea of what is cell division and what are the different types of cell divisions which occur in living organism. In this resource, I also discussed about where these three different kinds of cell divisions occur in living organisms, what purpose these cell divisions they serve for the organisms as well as the importance of a particular cell division and its significance to the organisms.